COSLYS Organic Anti Dandruff Shampoo reduces the production of dandruff and soothes the hair scalp. Its natural formula combines sanitizing Organic Ivy extract with anti-inflammatory Organic Brazil Nut Oil. Coslys Organic Dandruff Shampoo leaves your hair and scalp feeling healthy with a fresh green 100% natural fragrance ! 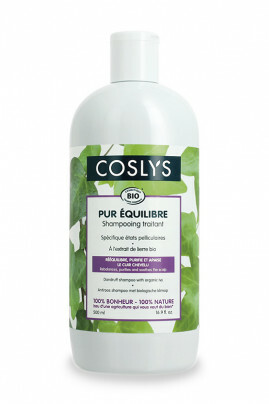 Apply COSLYS Organic Shampoo with Ivy extract on wet hair. Lather then rinse with clear water. For an intensive treatment, use it every wash for 15 days. Otherwise, use it in alternation with your usual shampoo. An efficient natural cocktail to get rid of those nasty dandruffs ! Aqua (water), spiraea ulmaria flower extract* (organic meadowsweet floral water), sodium cocoyl glutamate (cleansing foaming basis from coconut), decyl glucoside (solubilizant from sugar), sodium cocoamphacetate (amphoteric surfactant from coconut : foaming and softening), glycerin (natural-derived), copaifera officinalis (balsam copaiba) resin (copaïba extract), xanthan gum (thickener), hedera helix extract* (organic ivy extract), betholletia excelsa seed oil (Brazil nuts extract), aloe barbadensis leaf juice powder* (organic aloe vera gel), glyceryl oleate (anionic surfactant from copra, sunflower oil and natural glycerin), coco-glucoside (anionic surfactant from coconut, palm-kernel, sunflower oil and glucose), juniperus oxycetrus wood oil* (organic essential oil of cade), citric acid (pH regulator), parfum (100% natural fragrance), potassium sorbate (preservative system), sodium benzoate (preservative agents), tocopherol (natural Vitamin E), glycine soja (soybean) oil (non GMO soybean extract), dehydroacetic acid, benzyl alcohol (preservative agents), limonene, linalool (components naturally present in essential oils).